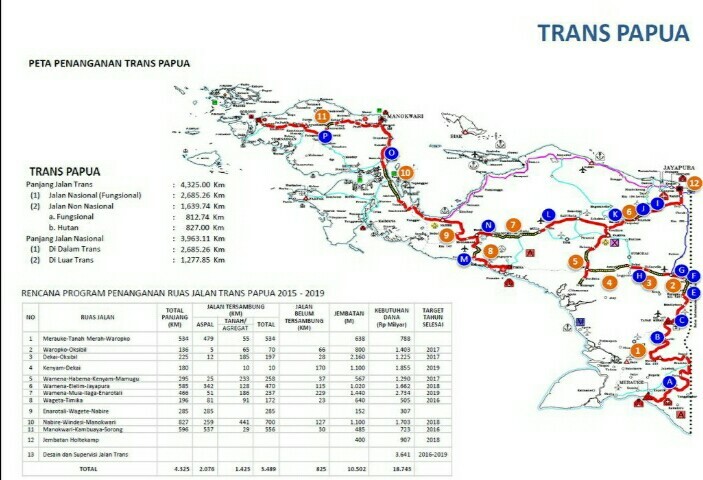 Handling Map of Trans-Papua Highway. Three years ago on October 20, 2014, Joko Widodo and Jusuf Kalla officially led Indonesia. By bringing the idea of ​​Nawacita, containing nine basic ideas of nation-building, Jokowi-JK steadily stepped into the Palace until 2019. Now, three years of various policies taken Jokowi-JK became public attention. It is only in this government that the price of fuel oil in Papua, the easternmost part of Indonesia, is the same as in other regions. BBM one price across Indonesia is expected to spur the heartbeat of national economy. In the reign of Jokowi-JK, Indonesia's development is not only centered on Java Island. The construction of the Trans-Papua Highway is one of the prestigious Jokowi-JK government projects in Papua and West Papua. Difficult terrain and sometimes vulnerable security situations, making the Ministry of Public Works and Public Housing involve the military in projects aimed at triggering the prosperity of the people of the cenderawasih earth. The road is expected to open up isolated areas, suppress expensive pricing, and increase connectivity between regions in Papua. In Papua, President Jokowi has inaugurated a cross-border post between the boundaries between Indonesia and Papua New Guinea located in Skouw, Jayapura, Papua. President Jokowi asserted, the construction of the cross-border post of the country with magnificent pride into local people and can be utilized for various economic activities. The Motaain Cross Border Post located in Belu, East Nusa Tenggara also stands majestically to the neighboring country of Timor Leste. Now the cross-border post becomes a new tourist attraction for both locals and tourists from Timor Leste. Not only that, cross-border post between countries in Entikong also built dashing overlooking neighboring Malaysia. The construction of cross-border post, not only for the post between countries, but also the pride of Indonesian citizens at the entrance to the two countries.